Political parties and their supporters swung into action yesterday, after President Tony Tan Keng Yam dissolved Parliament and news followed that the general election would be held on Sept 11. At People's Action Party (PAP) branches and opposition party offices across the island, activists finalised their candidate line-ups and worked to ensure that campaign flags, posters and, especially, nomination papers would be in order. Nomination Day will be next Tuesday, Sept 1, with the minimum of nine days to campaign before Cooling-off Day on Sept 10. Polling Day will be a public holiday. It is the first time since 1997 that a general election will be held on a weekday. Some PAP activists said holding the polls on Sept 12 would have clashed with community events planned for the last day of the Chinese Seventh Month. The widely anticipated news came two days after Prime Minister Lee Hsien Loong said at the National Day Rally that he would be calling the elections soon, and that they would be a critical one for the country. Yesterday, he underlined his message that this general election is about renewing and reinforcing the PAP's slate in Parliament to give Singapore the best leadership team to take the country forward. "I called this general election to seek your mandate to take Singapore beyond SG50, into its next half century," he said in a Facebook post. "You will be deciding who will govern Singapore for the next five years. More than that, you will be choosing the team to work with you for the next 15-20 years, and setting the direction for Singapore for the next 50 years." The elections, Singapore's 12th since independence, are likely to be the first since 1963 to see the PAP challenged in all seats. As many as nine opposition parties have indicated that they will put up a fight in all 89 seats across 16 group representation constituencies (GRCs) and 13 single-member constituencies (SMCs). The largest opposition party, the Workers' Party (WP), has said that it is targeting 28 seats. The elections will be the first in 60 years without the presence of founding Prime Minister Lee Kuan Yew, who died in March. Observers said the timing may be to the PAP's advantage, given the positive sentiments from the Golden Jubilee celebrations and the unprecedented expressions of solidarity in the week of national mourning following Mr Lee's death. The polls will also take place against the backdrop of global economic uncertainty, with international markets routed in recent days. The full-year growth forecast for Singapore itself has been revised downward to 2 per cent to 2.5 per cent. There are rising concerns too over global security and, indeed, Polling Day will be on the anniversary of the Sept 11, 2001 terror attacks on the United States. The snap 2001 elections called here after those attacks and amid a global recession saw the PAP's vote share surge by 10 points from 65 per cent in the 1997 polls to 75.3 per cent. The 2006 General Election, the first led by Prime Minister Lee Hsien Loong, saw the PAP get 66.6 per cent of the vote. But the 2011 election proved a watershed, when a rising opposition tide tapped into simmering discontent over housing affordability, immigration and cost of living issues to drag the PAP's vote share down to 60.1 per cent. 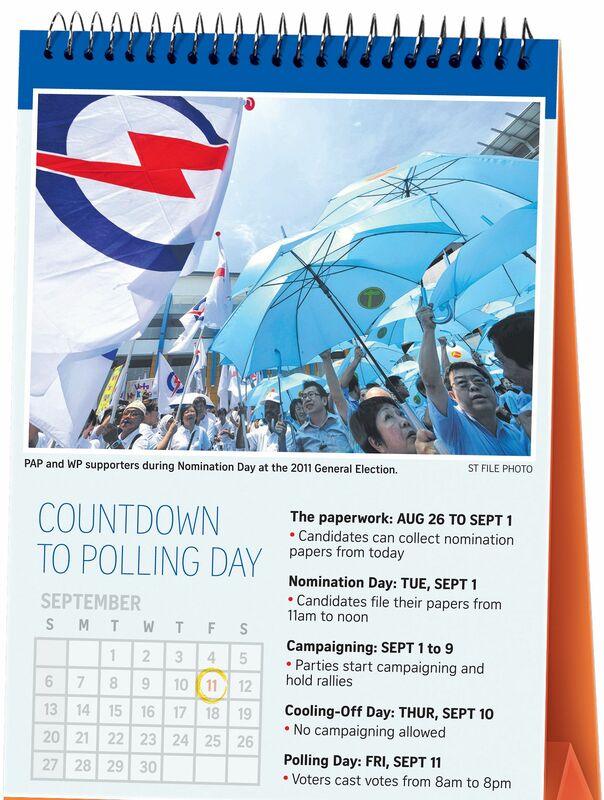 That election saw the WP winning its first GRC, ousting a high-powered PAP team led by Cabinet minister George Yeo. The WP retained Hougang SMC at the polls and went on to win Punggol East SMC in a by-election in 2013. Since 2011, the Government has embarked on a range of policy measures - some of which had been in gestation before the polls - to address voter concerns, and analysts say this year's elections will show how its efforts have been received. Said Dr Gillian Koh of the Institute of Policy Studies: "The GE will be a good measure of voters' sentiment on whether the Government has helped citizens access and afford the key essentials in life: if they think the Government has dealt with the immigration issue that was also tied to higher costs and congestion, and if they feel that the Government has, in the last four years, given them a stronger sense of security and assurance about work, family life and developing a fair and inclusive society." However, she felt a segment of voters would also hold the view that it is important to have some opposition representation in Parliament "to ensure that the Government is indeed responsive to the needs and concerns of Singaporeans". This is a theme the opposition parties can be expected to use to appeal to voters. The Singapore Democratic Party began introducing its candidates yesterday, and the WP will do so from today. The PAP has announced its line-up in all but four GRCs and Fengshan and Punggol East SMCs. It will name its teams for Marine Parade and Nee Soon GRCs today. Yesterday, Mr Lee said that strong support from Singaporeans is critical for the country to move ahead in a challenging environment and to stay special. "Here many races live in peace, and many from humble homes make good. We will surely meet challenges ahead, but whatever the world throws at us, as one people, we will overcome," he said on Facebook. "If you are proud of what we have achieved together, and support what we want to do for our future, please support me and my team. We have to do it with you, in order to do it for you, and for Singapore. Together, we can keep Singapore special for many years to come."